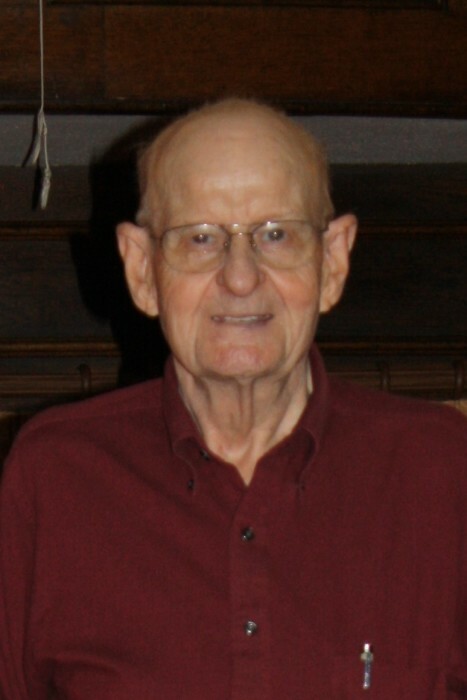 LaMont P. Spory, 92, of Paola, Kansas, formerly of Sutter, passed away at 6:04 P.M. Friday, April 5, 2019, surrounded by his loving family at Delmar Gardens in Lenexa, Kansas. LaMont Philip Spory was born July 10, 1926, the fourth child of John Spory and Bertha Myers Spory, in the Spory farm home, located near Breckenridge, in Walker Township in Hancock County Illinois. LaMont’s earliest memories were of the farm and his education in the Buckeye school located nearby. He attended the Sutter Presbyterian Church, later changed to Sutter Salem Bible Church, and had happy times among his family and cousins who all knew him as "Chub"! LaMont trusted the Lord as his Savior in those young years. LaMont met the love of his life, Joy Joanne Porter of Carthage in 1948 and they were married in the First Baptist Church of Carthage on June 11, 1950. They moved to rural Breckenridge and during those years three daughters were born. They loved music and harmonized beautifully together. They sang duets and in the choir at the church and also for the Carthage radio station in the early fifties. LaMont worked on the Keokuk, Iowa lock and dam during that time, and also farmed. He was a gifted builder and actually built the tiny house that he and Joanne first lived in. They attended Southwest Bible Church in Prairie Village, Kansas for many years. He and Joanne were active in the choir and sang duets together for many years. The family moved to Shawnee, Kansas, and it was during that time that LaMont first began working for the N.W. Dible construction company, a major builder in the area. He performed all aspects of home building through the sixties and into the seventies. In December 1972, the family moved to rural Paola, Kansas, and have resided there since. LaMont was then involved in condominium and apartment complex maintenance for Dible, and retired in 1993. After retirement, LaMont worked part-time for the Blue Valley school district in Overland Park, Kansas for several years. He earned awards and recognition including the Sunflower Award for his kindnesses to the young elementary disabled students there, and enjoyed his time there. LaMont is survived by his children: Linda Walls, of Overland Park, Kansas, Sheila Spory and Cindy Spory of rural Paola, son Philip of Overland Park, granddaughter Dr. Jennifer Walls, of Rogers, Arkansas, and grandson Brian Walls of Olathe. Visitation will be held at Sutter Salem Bible Church near Sutter on Wednesday, April 10, 2019, from 10:00 A.M. until time of services at the church at 11:00. Funeral services will be held at 11:00 A.M. at the church with burial to follow in the church cemetery. Memorials may be made to Sutter Salem Bible Church in Sutter, Illinois, and the Ehlers-Danlos Foundation. Printy Funeral Home of Warsaw is in charge of arrangements.